Published on Monday, July 18, 2016. This article appears in the June/July 2016 issue of American Craft Magazine. 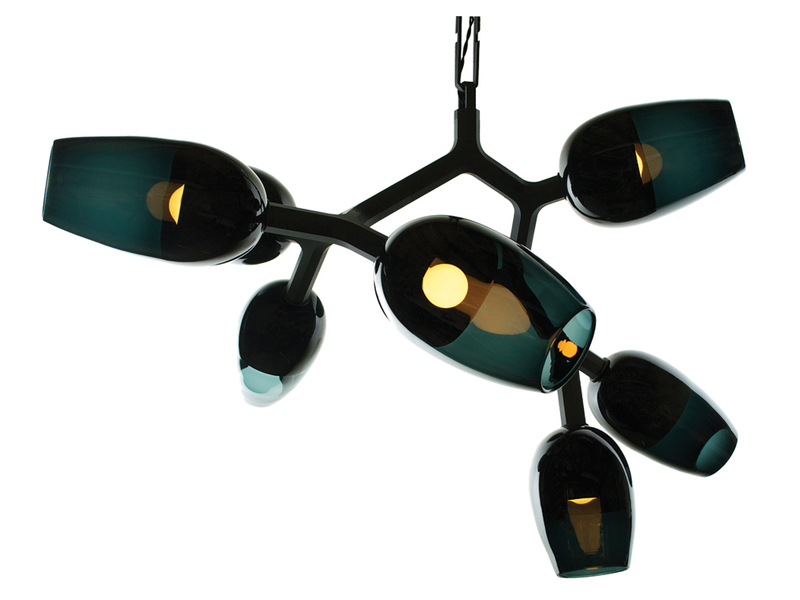 Eight-Light Scuro Antler chandelier, 2015, lead-free crystal, machined aluminum, 26 x 36 x 28 in. 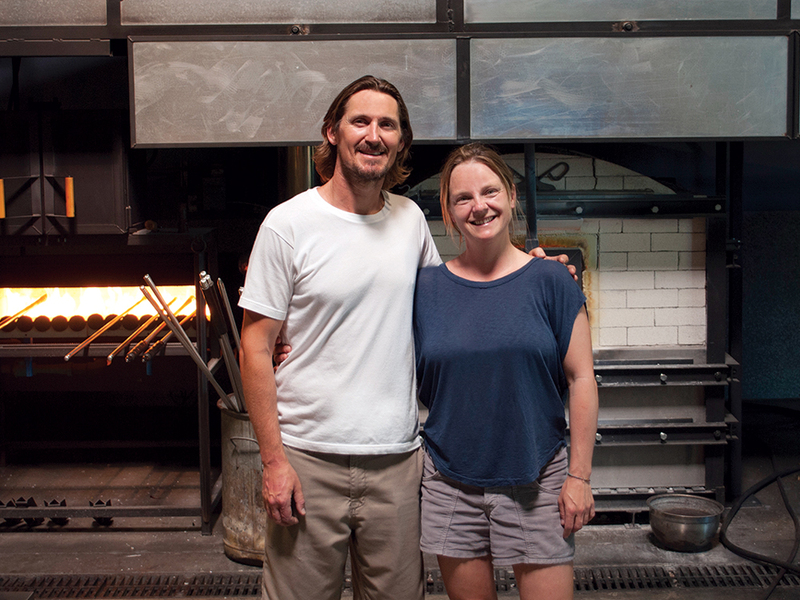 In the early days of building their glass business, Caleb Siemon and Carmen Salazar were pragmatic. They made things quickly to sell quickly, seldom using color because it was expensive. Then one day in 2001, they decided to have some fun. 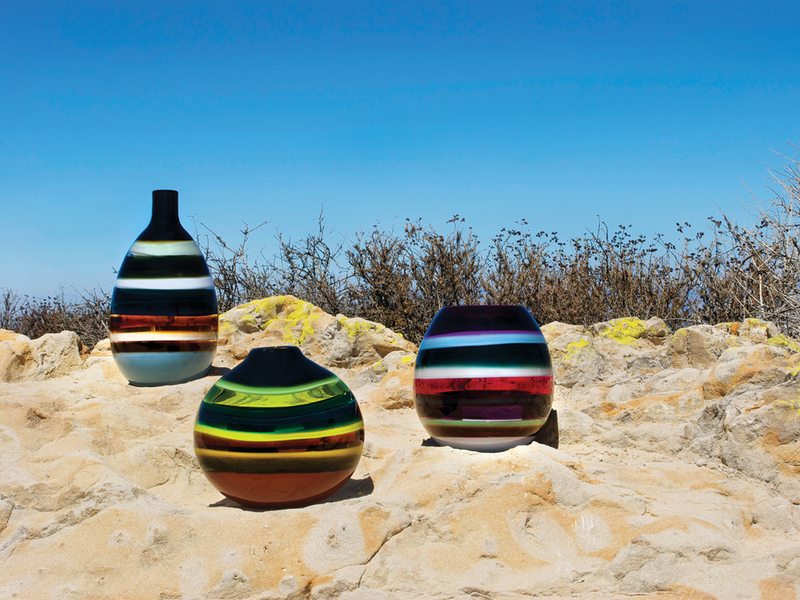 Today the couple produces a diverse line of handmade bowls, vases, and lighting in their 3,000-square-foot studio in Santa Ana, California. 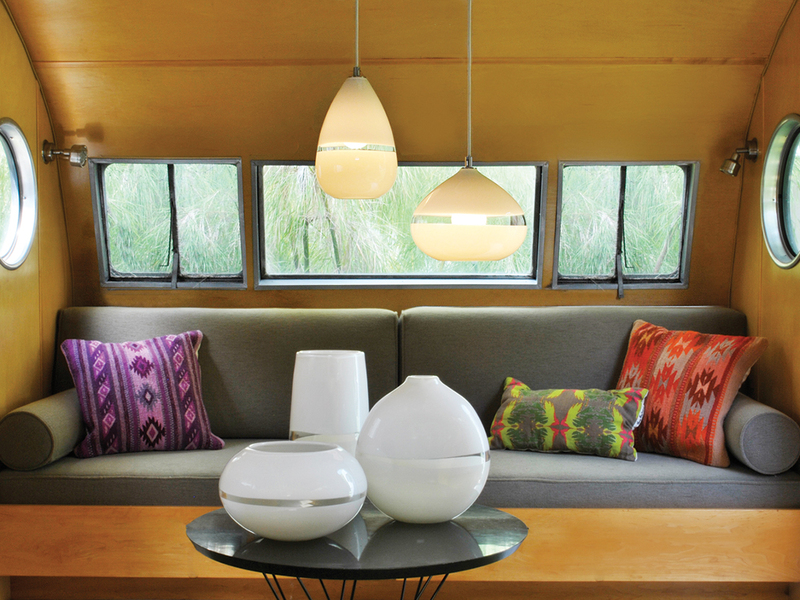 Sold in high-end home décor stores all over the country, Siemon & Salazar designs range from colorful, funky forms to pristine, clear pendants to sculptural chandeliers. The sensibility is modern California cool, inspired by the West Coast landscape and lifestyle they enjoy – even in their hot shop, which has big windows overlooking a garden. “We love being outdoors,” says Salazar. The pair met in their freshman year at Rhode Island School of Design. He was focused on glassblowing; she was into sculpture and architecture as well as glass. 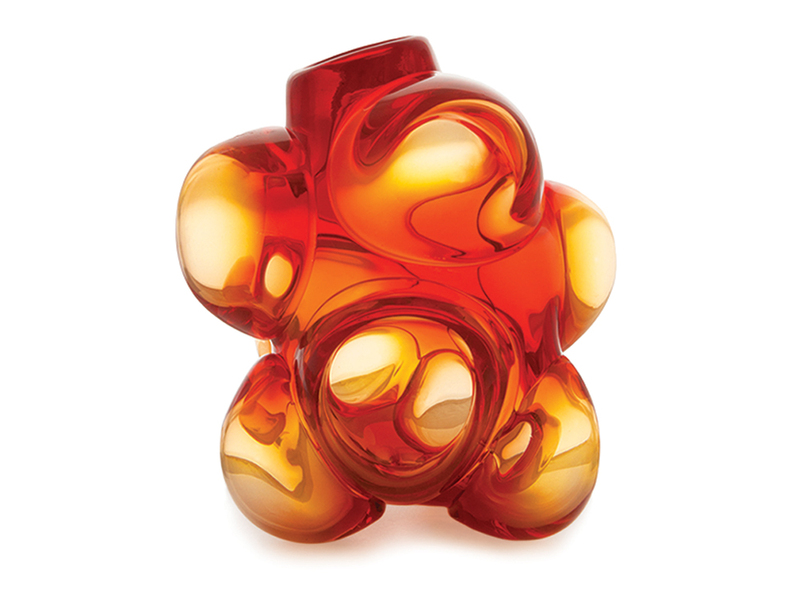 After graduation in 1997, Siemon went to the glass mecca of Murano, Italy, for an apprenticeship, while Salazar worked with an environmental artist and a metal sculptor in San Francisco. In 1999, he returned to his native Southern California to open his own studio and persuaded her to come help him build it. Love bloomed, and they married in 2003. They live with their son, 6, and daughter, 9, in a 1920s canyon cottage a short walk to the ocean in the artists’ colony of Laguna Beach. Just 20 minutes from the studio, “it’s a joyous place to go home to,” Salazar says. Though both partners are hands-on, having a capable team – four full-time employees and other part-time help – allows them to balance work and parenthood, and frees them to devote time to developing new designs. “We really strive to have a family here,” Salazar says of their close-knit studio environment. Hot new product: The Antler, an asymmetrical arrangement of glass globes that can hang in a vertical or horizontal configuration. Siemon and Salazar alternate layers of opaque and transparent colors to create their Banded vessels. Their palette is inspired by the landscape of Southern California. The Lattimo vessels and pendant lights – the word is Italian for “milk glass” – emphasize subtle tones and form. Aurora/Forest-Green Barrel vase, 2016, lead-free crystal, 8.5 x 6 in. dia. 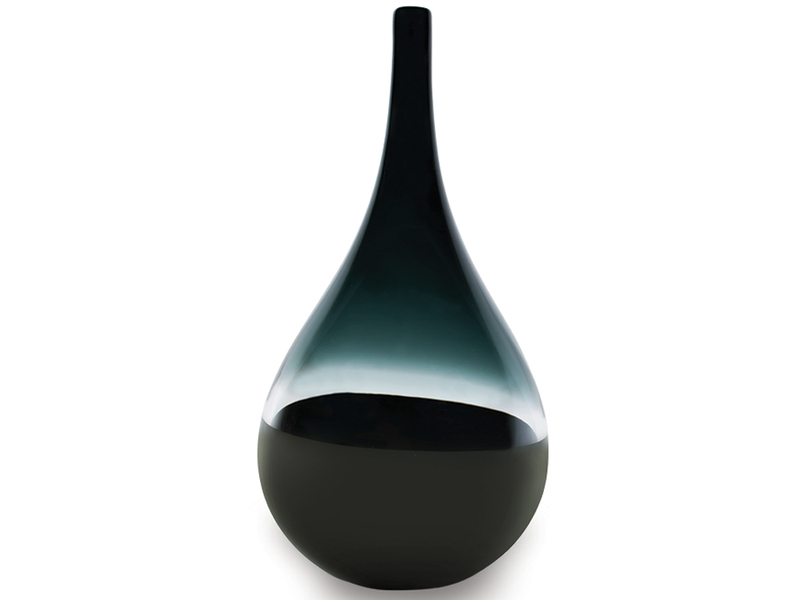 Gray/Black Scuro Teardrop vase, 2015, lead-free crystal, 14 x 7 in. dia. 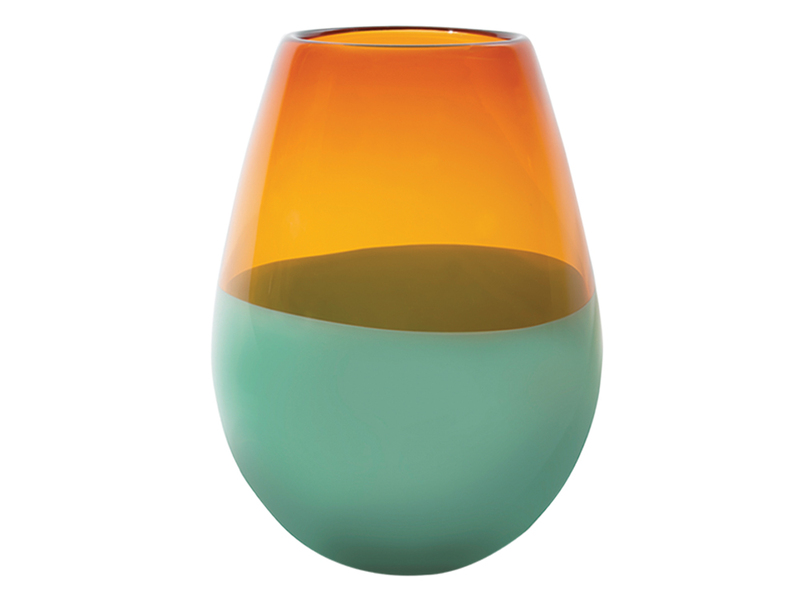 Tango Cumulo Barrel vase, 2012, lead-free crystal, 11 x 9 in. dia. 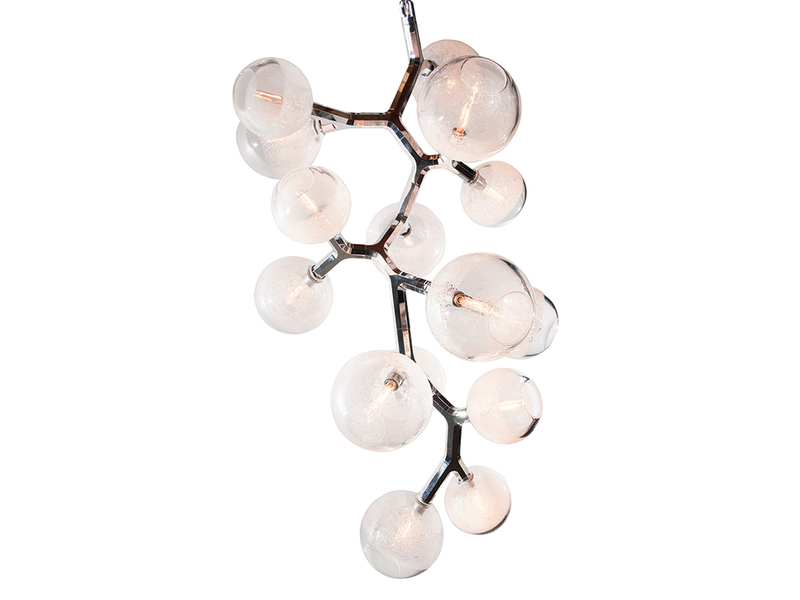 15-Light Clear Round Bubble Antler chandelier, 2015, lead-free crystal, machined aluminum, 54 x 30 x 30 in. 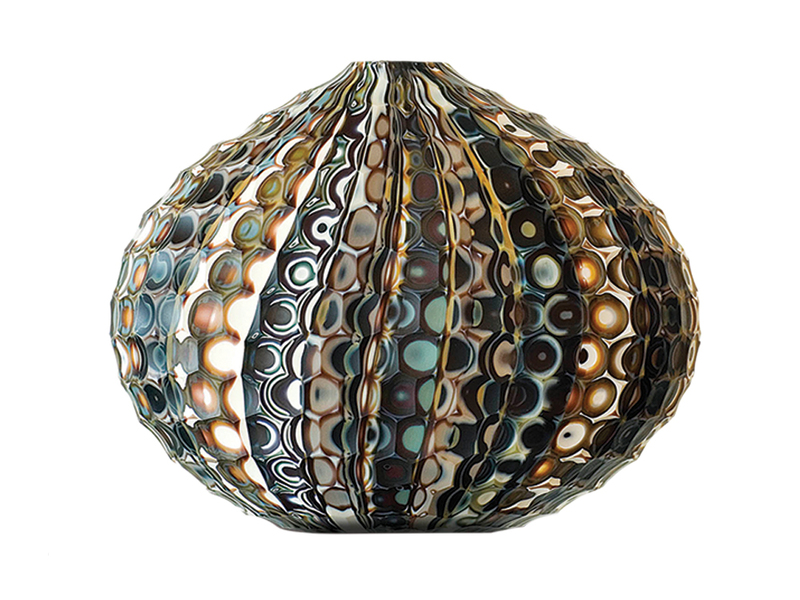 Mokume Battuto Earthtone Low Flat Oval vase, 2008, lead-free crystal, 9 x 10.5 x 3.5 in.